After a disagreement with Dutch Schultz over the robbery of a dairy in the Bronx among other things, “Mad Dog” Coll broke away and started his own gang, taking some of Schultz’s guys with him, they attempted to muscle in on Schultz’s rackets. This started a gang war in 1931 leaving bodies all over New York. After a botched shooting in 1931 left a child dead, Vincent Coll became the most wanted man in the nation. The newspapers named him “Mad Dog Coll.” Coll and members of the gang, Dominick Odierno, and Frank Giordani were named suspects in the murder of five year old, Michael Vengalli, who was an innocent bystander in the attempt to kidnap Joey Ral. Coll’s gang consisted of a few heavies, his older brother Peter who was very close to Coll growing up, they had been sent to the same institutions together and were taken in by their aunt who lived in the Bronx. Peter was arrested twice in 1924, for auto theft and robbery. In April 1929, he was picked up for impersonating a police officer. In 1930 he was got caught with possession of alcohol. His final arrest was in 1931 for possession of a firearm. While on bail, he was shot on killed while driving home the morning of May 30, 1931. Del Greco grew up in the Bronx, he joined a street gang and worked for the Schultz mob during the prohibition years. Del Greco was one of the loyalists who followed Vincent Coll when he broke away from Schultz and was a key lieutenant in the Coll gang. He was killed on February 1, 1932, when gunmen burst into a Bronx apartment and fatally shot him. Tuffy was a member of the Schultz mob and joined Coll’s gang when he split from Schultz. He was arrested at the Cornish Arms Hotel in October 1932, along with Coll. He was charged as the shooter in the murder of Joe Mullins in the Bronx, convicted and sentenced to the death. Dominick “Tuffy” Odierno was executed in the electric chair on July 1, 1932. Basile was arrested in the October 1931 roundup of the Coll gang, but released shortly thereafter. In 1932, while he was hiding out with Fats McCarthy and George Kelly in Albany, New York, Mike was involved in a shootout with police, resulting in his arrest. Charged with attempted murder in the first degree, he was found guilty and sentenced in 1933 to a 17 to 30 year term at Clinton Prison. Of course there were other members of the gang, they will be covered later. 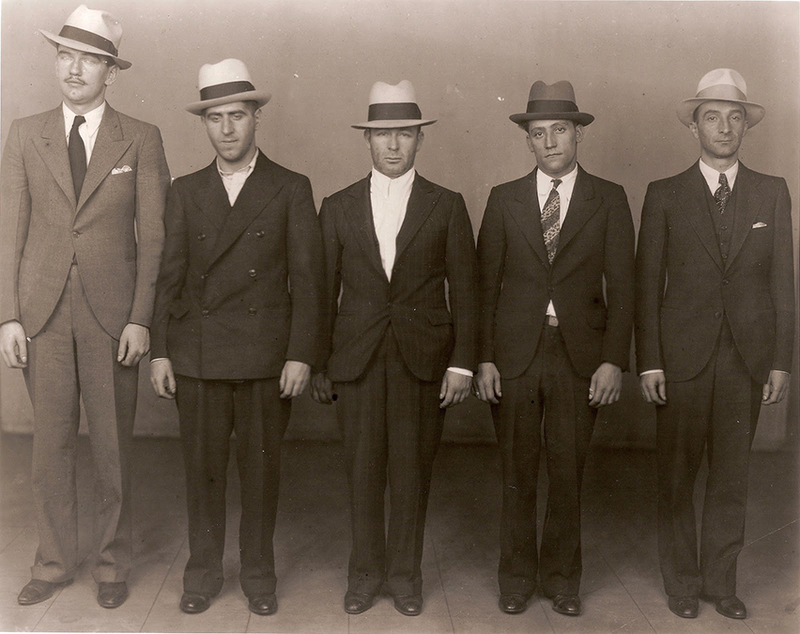 Left to right: Vincent Coll, Michael Basile, Pasquale del Greco, Dominick Odierno, and Frank Giordani.